Making purchases, collecting rewards or frequent flyer points? Check our various credit card deals from vendors like AMEX, Citi, Westpac, ANZ, St George & more! Bring over any outstanding balances and enjoy 0% p.a. interest for 14 months (reverts to the cash advance rate). Please note, no interest free days apply to retail purchases while you have a Balance Transfer. New cards customers only. Your total balance transfers may not exceed 80% of your credit limit. The 0% p.a. interest rate applies to balances transferred with this offer at point of application for a period of 14 months, commencing once the balance transfer has been processed. At the end of the balance transfer period, the interest rate on any outstanding transferred balance will revert to the variable Annual Percentage Rate for Cash Advances, currently 21.74% p.a. This offer excludes balances transferred from Citibank unsecured credit products. Please note you are not entitled to any interest free days to retail purchases whilst you have a balance transfer. This means that all spend will be charged interest at the applicable annual percentage rate. This offer is valid until 31 March 2019. Post this advertised date; Citi reserves the right to continue, withdraw or change the offer at any time without notice. Terms, conditions and eligibility criteria applies. Fees and charges apply. A commission fee is paid to Credit Simple on approved accounts. This is Citi’s current standard offer. Receive up to 400k bonus Points (20k bonus Points each month for 20 months from approval when you spend $1k or more in each statement period), unlock special privileges like 1 complimentary night's stay per year at one of Citi’s selected 4 or 5 star partner hotels around the world. To be eligible to receive up to 400,000 bonus Points you must apply for a Citi Prestige Card by 30 April 2019. You will receive 20,000 bonus Points when you spend a minimum of $1,000 during each monthly statement cycle. A maximum of 400,000 bonus Points can be earned over the first 20 monthly statement cycles. If you do not meet the minimum spend for one monthly statement cycle, you forfeit the bonus Points for that monthly statement cycle, however you are still eligible for subsequent months' 20,000 bonus Points if you meet the minimum spend within each monthly statement cycle during the promotional period. Cash Advances, Balance Transfers, Refunds, Chargebacks and Special Promotions do not contribute to the spend threshold. The bonus Points will be credited within 6 - 8 weeks of meeting the spend criteria for any given month. All rewards are subject to the Terms and Conditions of the Citibank Rewards Program. Please note that if you have a balance transfer, you will be charged interest on any spend that you make. This offer is valid until 30 April 2019. Post this advertised date; Citi reserves the right to continue, withdraw or change the offer at any time without notice. Earn up to 200,000 bonus Citi reward Points, take advantage of 0% p.a. on balance transfers for 12 months & a reduced annual fee of $49 in the first year that reverts to $149 thereafter, unless you qualify for a 50% annual fee discount by spending $24,000 in the preceding year. Ends 30/04/19. 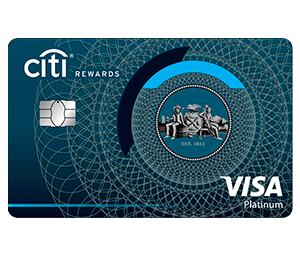 To be eligible to receive up to 200,000 bonus Points, you must apply for a Citi Rewards Platinum Credit Card by 30 April 2019. You will receive 10,000 bonus Points when you spend a minimum of $1,000 during each monthly statement cycle. A maximum of 200,000 bonus Points can be earned over the first 20 monthly statement cycles. If you do not meet the minimum spend for one monthly statement cycle, you forfeit the bonus Points for that monthly statement cycle only, however you are still eligible for subsequent months 10,000 bonus Points if you meet the minimum spend within each monthly statement cycle during the promotional period. Cash Advances, Balance Transfers, Refunds, Chargebacks and Special Promotions do not contribute to the spend threshold. The bonus Points will be credited within 6 - 8 weeks of meeting the spend criteria for any given month. All rewards are subject to the Terms and Conditions of the Citibank Rewards Program. Points do not expire while the card remains open and in good standing. Please note that if you have a balance transfer, you will be charged interest on any spend that you make. This offer is valid until 30 April 2019. Post this advertised date; Citi reserves the right to continue, withdraw or change the offer at any time without notice. $49 in your first year, and 50% off (currently $74.50) following, where $24,000 is spent in prior year. Otherwise reverts to discounted $149. • 0% p.a. for 13 months on balance transfers; 1% BT fee. This offer is valid until 31 December 2019. Post this advertised date; Citi reserves the right to continue, withdraw or change the offer at any time without notice. New cards customers only. Terms and conditions and eligibility criteria applies. Fees and charges apply. A commission fee is paid to Credit Simple on approved accounts. This is Citi’s current standard offer. Earn up to 300k bonus Citi Reward Points, take advantage of 0% p.a. on balance transfers for 12 months (no BT fee) & a reduced annual fee of $195 in the 1st year. Annual fee reverts to $395 thereafter, unless you qualify for a 50% annual fee discount by spending $48k in the preceding year. Ends 30/04/19. To be eligible to receive up to 300,000 bonus Points you must apply for a Citi Rewards Signature Credit Card by 30 April 2019. You will receive 15,000 bonus Points when you spend a minimum of $1,000 during each monthly statement cycle. A maximum of 300,000 bonus Points can be earned over the first 20 monthly statement cycles. If you do not meet the minimum spend for one monthly statement cycle, you forfeit the bonus Points for that monthly statement cycle, however you are still eligible for subsequent months 15,000 bonus Points if you meet the minimum spend within each monthly statement cycle during the promotional period. Cash Advances, Balance Transfers, Refunds, Chargebacks and Special Promotions do not contribute to the spend threshold. The bonus Points will be credited within 6 - 8 weeks of meeting the spend criteria for any given month. All rewards are subject to the Terms and Conditions of the Citibank Rewards Program. Please note that if you have a balance transfer, you will be charged interest on any spend that you make. This offer is valid until 30 April 2019. Post this advertised date; Citi reserves the right to continue, withdraw or change the offer at any time without notice. First year annual fee discount. Enjoy the benefits of the Citi Signature Card for just $195 in your first year. Plus, get a 50% annual fee discount (currently $197.50) each year if you have spent $48,000 in the previous year - that’s $4,000 a month on average. Otherwise your annual fee will revert to the full annual fee, currently $395. Turn everyday spending into the endless possibility of something special with our Latitude Infinity Rewards card. With 1 point for every $1 you spend, earn points that are never capped & never expire! Terms, conditions and approval criteria apply. Start your holiday with a $200 Travel Credit each year. Earn up to 3 Membership Rewards points for every $1 spent. A low ongoing annual fee and more. ANZ First has our lowest annual fee and also comes with complimentary 90-Day Purchase Security Insurance and Extended Warranty Insurance on your purchases. Eligibility criteria, T&Cs, fees and charges apply. 0% p.a. first 18 months on balance transfers with a 2% Balance Transfer fee. Reverts to standard balance transfer rate, currently 21.49% p.a. Receive 50K bonus Velocity Points when you apply online, are approved & spend $3k on your new Card within the first 3 months. Earn 1.25 Velocity Points per $1 spent, except government bodies where you will earn 0.5 Velocity Points per $1 spent. Terms, conditions and eligibility criteria apply. This offer is available to new Card Members, as well as Bank-issued American Express companion cardholders. *When you spend $1,000 on eligible purchases in the first 3 months from approval. New card. Limited time. Spend and eligibility criteria, T&Cs, fees and charges apply (including annual fee of $95). Receive 15,000 Membership Reward Points or 7,500 Qantas Points when you apply, are approved and spend $750 outside of David Jones within the first three months of becoming a Card Member. Terms, conditions and eligibility criteria apply. This offer is available to new David Jones American Express Card Members who apply, are approved and spend $750 on the Card outside David Jones within the first 3 months of becoming a David Jones American Express Card Member. If you opt in to Membership Rewards, you are eligible to receive 15,000 Membership Rewards points with a David Jones American Express Card. If you opt in to Qantas Frequent Flyer, you are eligible to receive 7,500 Qantas Points with a David Jones American Express Card. Reward Points are earned and converted to your chosen rewards program in accordance with and subject to the David Jones Storecard and David Jones American Express Reward Points Terms and Conditions available at davidjones.com/rewardpoints. Please allow 8 to 10 weeks after you have made the eligible spend for the points to be credited to your account. Customers applying for the David Jones American Express Platinum Staff Card or the David Jones American Express Staff Card or Card Members who currently hold or who have previously held any other David Jones Credit Card product issued by American Express Australia Limited in the preceding 18 month period are ineligible for this offer. A credit card with a low ongoing interest rate for your everyday purchases. And now, 0% p.a. first 15 months on balance transfers with no balance transfer fee*. *0% p.a. first 15 months on balance transfers with no balance transfer fee. Reverts to standard balance transfer rate, currently 21.74% p.a. Eligibility criteria, T&Cs, fees and charges apply. New card. Limited time. Spend and eligibility criteria, T&Cs, fees and charges apply (including annual fee of $80). Receive 80,000 Membership Rewards points when you apply online & are approved & spend $3,000 on your Card in the first 3 months. Plus, enjoy a $450 Travel Credit each year. Term, conditions and eligibility criteria apply. This introductory offer is available to new American Express Card Members, as well as Bank-issued American Express companion cardholders. Receive 30,000 Reward Points or 15,000 Qantas Points when you apply, are approved and spend $750 outside of David Jones within the first 3 months of becoming a Card Member. Terms, conditions and eligibility criteria apply. This offer is available to new David Jones American Express Platinum Card Members who apply, are approved and spend $750 on the Card outside David Jones within the first 3 months of becoming a David Jones American Express Platinum Card Member. If you opt in to Membership Rewards, you are eligible to receive 30,000 Membership Rewards points with a David Jones American Express Platinum Card. If you opt in to Qantas Frequent Flyer, you are eligible to receive 15,000 Qantas Points with a David Jones American Express Platinum Card. Reward Points are earned and converted to your chosen rewards program in accordance with and subject to the David Jones Storecard and David Jones American Express Reward Points Terms and Conditions available at davidjones.com/rewardpoints. Please allow 8 to 10 weeks after you have made the eligible spend for the points to be credited to your account. Customers applying for the David Jones American Express Platinum Staff Card or the David Jones American Express Staff Card or Card Members who currently hold or who have previously held any other David Jones Credit Card product issued by American Express Australia Limited in the preceding 18 month period are ineligible for this offer. $0 annual fee. Earn 0.75 Velocity Points per $1 spent, except government bodies in Australia where you will earn 0.5 Velocity Points per $1 spent, plus 1 additional Velocity Point per $1 spent on purchases with Virgin Australia. Term, conditions and eligibility criteria apply. Enjoy 30K bonus Qantas Points when you apply online, are approved & spend $3K on your new Card within the first 3 months. Earn 1 Qantas Point for every $1 spent on Card purchases, except spend at government bodies in Australia where you will earn 0.5 Qantas Points per $1 spent. *When you spend $2,000 on eligible purchases in the first 3 months from approval. New card. Limited time. Spend and eligibility criteria, T&Cs, fees and charges apply (including annual fee of $295). Reduced annual fee of $49 in the first year. Reverts to $99 thereafter. 0% p.a. for 15 months on balance transfers (BTs), with a 1.5% BT fee (reverts to 21.74% p.a. Cash Advance rate after 15 months). ^Reverts to 21.74% p.a. Cash Advance rate after 15 months. Fees and charges apply. Terms and Conditions apply. Credit criteria apply. New cards customers only. A commission fee is paid to Credit Simple on approved accounts. This is Citi's current standard offer. Looking for the ultimate travel companion travel card? The 28 Degrees Platinum Mastercard is an award winning travel card with no currency conversion fees, no overseas fees on purchases, no annual fee & free global Wi-Fi. Terms, conditions and approval criteria apply, click here for details. 21.99% Interest rate on purchases. Balance transfer rate of 4.99% p.a. is for 6 months only and then 21.99% p.a. thereafter. Late fee is $30. Minimum Credit limit = $6,000.00. Receive 50,000 Membership Rewards Bonus Points when you apply online, are approved & spend $3,000 on your new Card within the first 3 months. Start exploring with a $400 Travel Credit every year. Term, conditions and eligibility criteria apply. This offer is available to new Card Members, as well as Bank-issued American Express companion cardholders. *When you spend $4,000 on eligible purchases in the first 3 months from approval. New card. Limited time. Spend and eligibility criteria, T&Cs, fees and charges apply (including annual fee of $375).